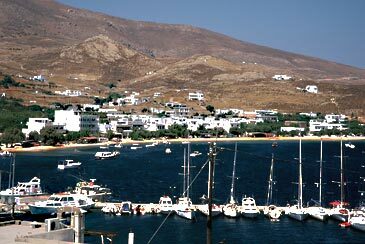 Serifos is an island of lovely beaches, mountains and a stunning chora with views. 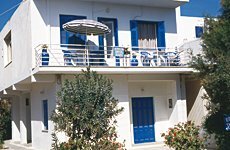 The moment you step off the ferry, you are in the midst of local life – the village in front of you, the long sweep of Livadiou beach to your right and the much less busy Livadakia beach to your left five minutes away on foot over a small bluff. 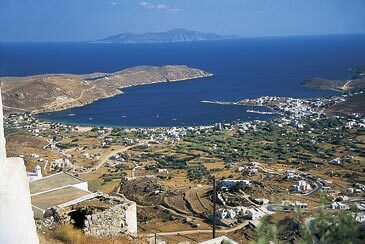 Blinking protectively over the bay is the jumble of brilliant white houses of the hill-top chora. All our accommodation is right on the beach. With bars and tavernas (and some night life if you choose Livadiou) on the doorstep, you hardly need shoes, let alone transport. If you want a change from Livadakia Beach, head south for two more; if you want a change from Livadiou, walk 2km north and you will be rewarded by a luscious swathe of sand and a tempting taverna at Psili Ammos. 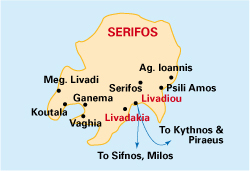 Serifos is a perfect island for exploring by scooter or car. It is very hilly and the views down to dozens of wide, usually deserted, swathes of golden sand are inviting. 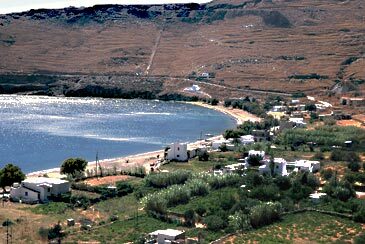 The best are perhaps in the SW corner at Ganema, Koutala and Megalo Livadi, most of them with tavernas. If you make a circuit taking in at least part of the north, you will eventually see the stunning panorama of the citadel-like chora before you, backed by the horseshoe Livadiou Bay beyond and below. The chora is a delight to explore, so stop off for a coffee before you descend. The gateway airport is Athens. 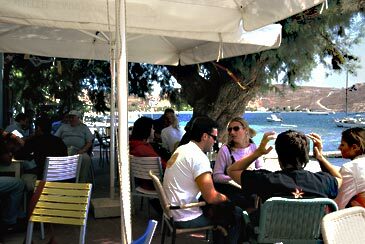 There are ferries to Kythnos from Piraeus and from Lavrion, a little south of the airport. 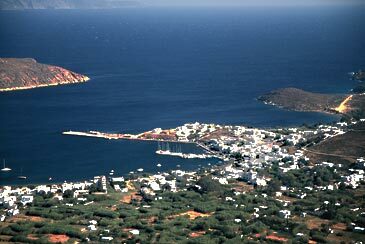 If you have hired a car from the airport, drive south to nearby, hassle-free, Lavrion. Otherwise take the metro to Piraeus for the fast catamarans. 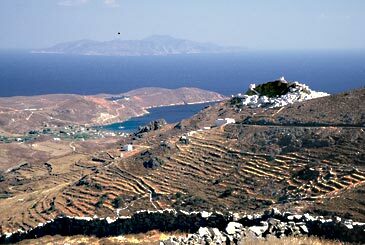 Serifos: even better than being on the beach? An old favourite, much up-graded over the years. 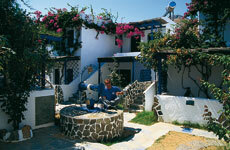 The beach gate leads you into the front garden with shady restaurant along one side; beyond it are the bedrooms, built like a Cycladic village round a well. Air-con, TV, fridge, hair-dryer; B&B. Right on the sea front and well past the section with traffic. Clean simple rooms, handy for bars, shops – and the beach.